Snow, like you have never experienced before! Your ride, new terrain, all new adventures! From dirt to snow. Fuel your desire to ride all year long, with the industry-leading Timbersled System. Loose Wheels is your go-to Duck Creek Timbersled Dealer. Located in the heart of Duck Creek Village, everyone here knows where to find us. 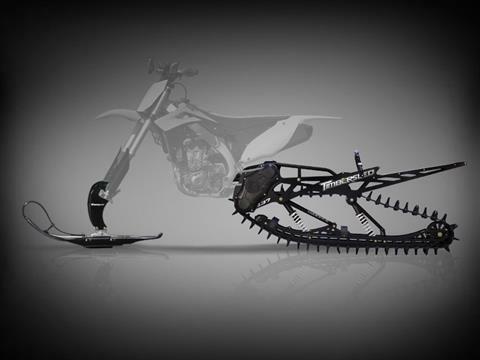 Take your bike from dirt to snow with the Timbersled System. We have a full Timbersled line-up with systems made for riders of different sizes, riding styles and who prefer to ride on various types of terrain. We offer systems that fit almost every off-road dirt bike from the early 90’s to now! With our system, you won’t have to choose between a dirt bike and a snowmobile now, you’ll be able to have both! Call us today to see if your dirt bike will work with our system. The Fixed Strut Install Kit is an economical option to help you begin riding. The TSS Install Kit includes an upgraded shock that adds up to 8.5" more rear suspension travel for performance-minded riders. Both Install Kits come with all specific install components for your bike and Timbersled system. Complete Installation Instructions and videos are available to walk you through the installation process. If you don’t feel comfortable doing it yourself, let us know and we can help with getting it ready to ride in the snow, or get you back to riding on the dirt! We’re a full-service Duck Creek Village Timbersled Dealer, so we are here to meet your needs!